It was good to go there again after a 2 year absence. Thats all of them folks enjoy. What a night. The Jet cars were there. Talk about a Burnout. The jet cars have fire.Also who would think of racing snow mobils on a 90 degree day? Well put some wheels on them and fly down the track at 150+ mph. 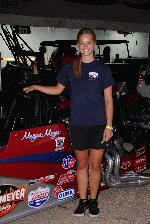 Also a big Happy Birthday to Megan Meyer. She is a driver and had just turned 19 on 6-10-2012. Take a look at the jet car fire photos. Awsome.